Crystal Clear is fast acting, versatile natural clarifi er that is both NON-TOXIC and BIODEGRADABLE. Its unique formulation is specifi cally designed to. Clarify the water using Crystal Clear. Clear cloudy water and make it sparkle. Aid in removal of fats, oils and suntan lotion. Aid in removal of dissolved metals and dead algae spores. Aid in prevention of scum line. When there is a heavy bather load, an extra dose is advised as there will be additional body fats in the water which could cause cloudiness and foaming. 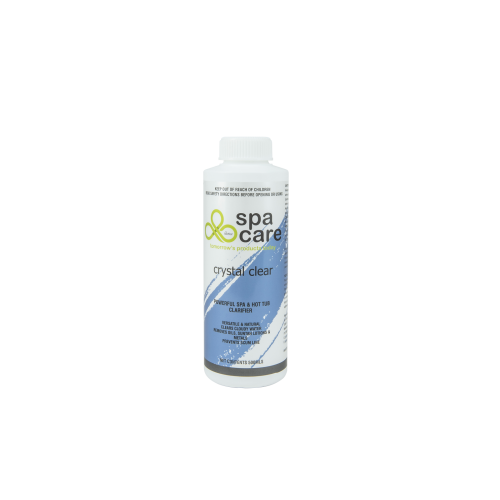 Spa Care™ Crystal Clear should be added in accordance with the directions given. The active constituent in Ultra Spa Plus 4 in 1 was originally used by the U.S. Navy to clear seawater for underwater photography. Today it is predominantly used as a fat metabolizer in medicine and it is now used widely in medical industries around the globe. Research has found Chitosan assists in prevention of cancer.